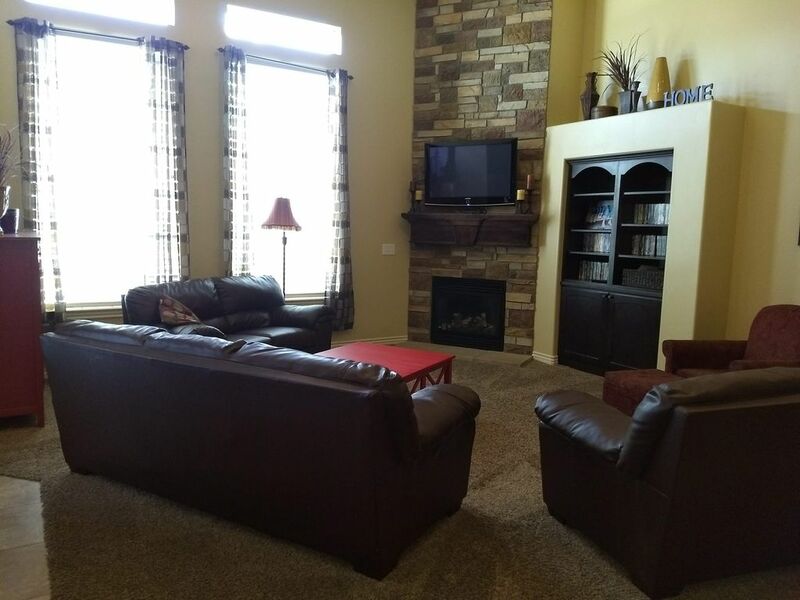 This is a beautiful home located 30 minutes from major ski resorts, Utah Jazz games, the airport, USANA, nightlife, and family-friendly activities all over Utah! The Trax station is just minutes away, as well as restaurants and shopping. It is just over 4200 Sq. Ft. with 7 large bedrooms. It has a large open family room and kitchen, fireplace, hot tub, fire pit, gym, entertainment room with ping pong table, kids room, and private 3 car driveway. It is on a quiet street with several parks and a bike/walking trail within walking distance. House was clean and well maintained. Kitchen was well stocked with cooking essentials. Beds were comfortable. Owner went out of her way to accommodate us. Would book again. What a great house for a family gathering! We had 14 adults in this house and the accommodations were great! Plenty of gathering space, but privacy for everyone. Worth the 35 minute drive to downtown salt lake to be in a quiet neighborhood, close to grocery stores, but not right in town. We enjoyed our stay and will remember this house for our next occasion in Salt Lake City! We had a wonderful stay at Emily's home. Our purpose was to have a ski trip for our family which turned out to be great. The home is perfect for a group like ours. We all enjoyed the hot tub, the game room and the well equipped kitchen. The seven bedrooms made it very comfortable for all. The room with four twin beds was a big hit for the small boy cousins who had a great time being together there. Emily is a vey good host and did a awesome job for us. I would highly recommend this beautiful home. Our stay in this beautiful home was exactly as advertised. The owner was very responsive and easy to work with. We stayed here for our daughter's wedding and the only downside was the fact that I was too busy to enjoy and relax in this spacious and lovely home. The owner made sure we had everything we needed and the house was clean and well kept. Thanks again Emily for helping us to enjoy our stay and making sure that everything was to our liking. Large beautiful home. Great for an extended family get together. Had a wonderful time staying at this house. Emily was very quick to respond with any questions or issues that we had. The only minor complaint is that with 11 people in the house, the hot water did run out after 4 people showered. We had to wait a little before more could shower. But overall it was a great place. Wished we could have used the hot tub and fire pit but with snow and limited time we didn’t get to enjoy it. Maybe next time! Thank you for letting us stay at your place.